How to fix an offcenter fork? Hi everyone. I have a fork that appears to be slightly bent. The front wheel is slightly off center. I have tried two wheels and verified it is not a wheel dishing issue. the fork is steel so it can be bent back into place. I don't know the best method to attempt this. Does anyone have any thoughts? I can post some picks later if that will help. 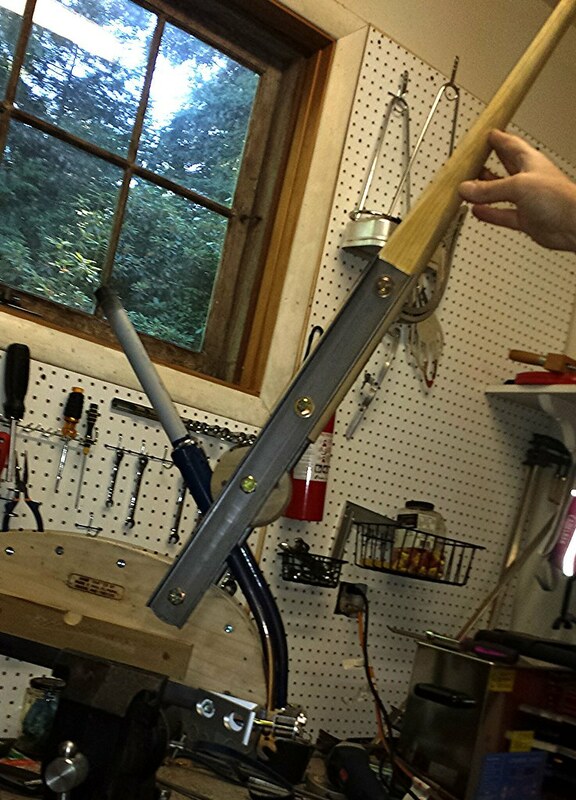 Find an Old School bike shop with a fork jig and someone who knows how to use it. Pay them $ to do it properly. Last edited by danmyersmn; 03-17-18 at 07:19 AM. It's hard to tell from your photo, but the first thing to check are the dropouts to make sure they're parallel, and that the hub is fully inserted into them. To be honest, that's rarely the issue, but it's the easiest thing to check and fix. If those two things aren't the cause, then one side is longer than the other. Some people will use a round file to deepen the pocket of the dropout. Almost no one will add a bit more rake, or offset to one side, which effectively shortens it (slightly more curved). Do this, had a frame and fork straightened in 2015 by our local frame builder and he charged $80 for both. Bike rides beautifully. 9 out of 10 bikes I get have missaligned frames. The quality 531 or Columbus frames I take to a shop. The others can be aligned by hand. I typically can align a fork by bending, using the ground as leverage. You want to bend the blade out on the side the wheel is closer to. Then bend the other blade to get spacing correct. Rear triangle can be aligned in a similar fashion. I use the string technique to eyeball the missalignement. Bend with my hands or by stepping on rear triangle and pulling out stays as necessary. Best to learn on some cheapo bikes before tackling something nice. Almost all the bikes I worked on at the bike shop I worked at were out of whack. It became general practice to check alignment with a string before doing any work on a bike. Bend it straight and then proceed with repairs. Most of what I was repairing were department store bikes. Bending frames and components was the only way to get them to work well. I've straightened literally hundreds of forks and chainstays on a wide range of bikes, out on my wooden deck using foot power, but as mentioned one MUST do one side at a time while keeping tabs on the dropout spacing for reference as to how much cold-set movement has occurred. Caution is in order to assure that one does not over-bend and possibly buckle a fork tube, and this can be prevented by placing a tilted 2X4 under the dropout to limit it's flex distance. The height can be adjusted by sliding a block under one or both ends of the 2x4, and will need to be adjusted as you go. But the very first thing is to verify the nature of the defect that is putting the wheel off-center within the fork crown. IF the wheel is tilted so as to offset the rim to the left at the crown, then the rim will also be found to be offset to the right down where the rubber meets the road, AND THE BIKE WILL PULL TO THE LEFT when ridden no-handed. DO NOT assume the dropout height is causing the tilt and start filing away as this is much less often the case, and you will be left with a defective dropout cut too deep! So, with the above I mind, you want the tire centered in the crown and the bike rolling straight by means of the appropriate corrections. If the dropout spacing is found to be as it should be (matching the bike's original front hub, 96-100mm), and the wheel centers up within the crown and the bike pulls to one side, then there is a good possibility that it is the steer tube and/or main triangle that is out of whack, and side-loading the dropout with the wheel installed might be used to correct this. I had to do just that to get my 1984 Trek 720 tracking straight as it was off when new, and in this case I used picnic benches to support the bike in such a way that I could bounce on it with my feet as if it were a trampoline. 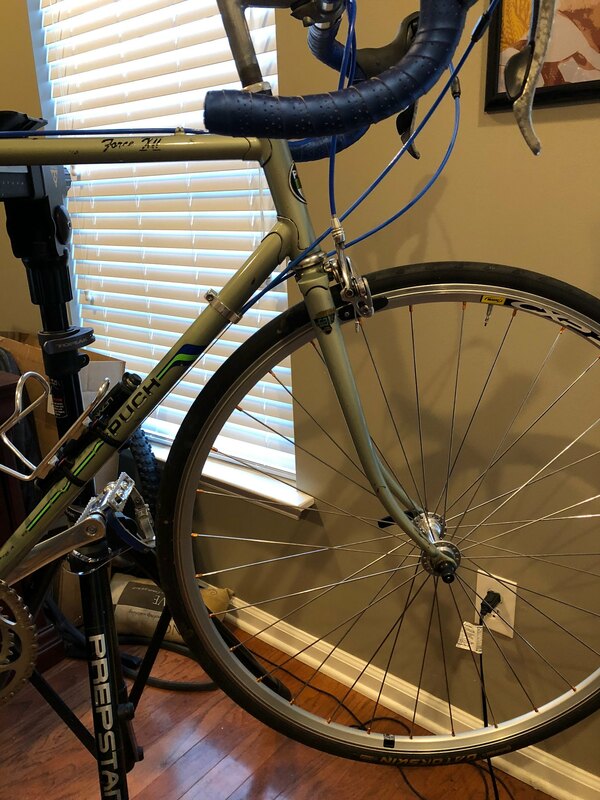 I fixed it in just a couple of tries but sure wouldn't recommend this with a valuable bike, mine has ridden straight ever since but that was back then and I was much younger and risk-tolerant back then! Rear frame corrections can be done similarly to individual fork leg corrections, though offset in back does not much affect a bike's steering so is diagnosed with string and by eye. Experience with bending steel and tubing is recommended before attacking your bike frame and fork with backyard forceful methods, as bike tubing can be extremely resilient and springy or can be surprisingly soft, you have to be prepared for either sort of response to deliberate flexing and in some cases a lot of force is needed. Frame builders make short work of such issues but will sometimes request that the bike be almost completely stripped first. I have literally fixed frames and forks on the side of the road using only my hands and feet and the removed wheel's axle as a measuring device, so for now better not to get me started on roadside chainring truing using a rock and a piece of tree root. Lastly, dropout parallelism is quite easy to first check and then correct at home if it is appreciably off, using just an axle with a couple of locknuts jammed together near one end of the axle. Holding the grip surface of the locknut against the inside surface of a dropout points the other end of the axle to the opposite dropout, and any significant error is visible by how far off from the same axle position in the opposite dropout that the axle points to. 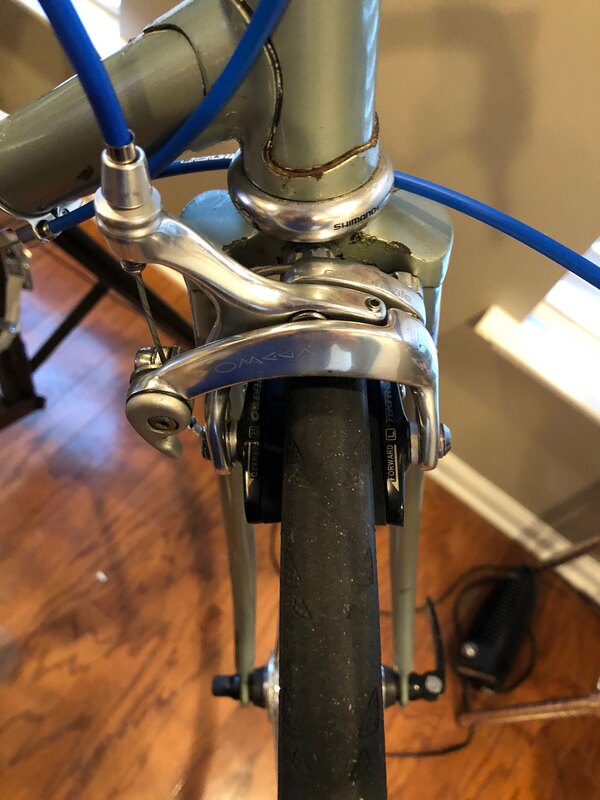 Dropout parallelism is also seen to be good when flipping/tightening the quick release lever, as there should be no springy action as the dropouts are clamped, and the derailer should not be seen to drift in or out of plane during the QR lever's tightening. Correction of dropout parallelism or derailer hanger (always do the dropout first) can be done with a LARGE Crescent wrench, positioning the wrench with both tines of the dropout gripped together unless just one is bent. 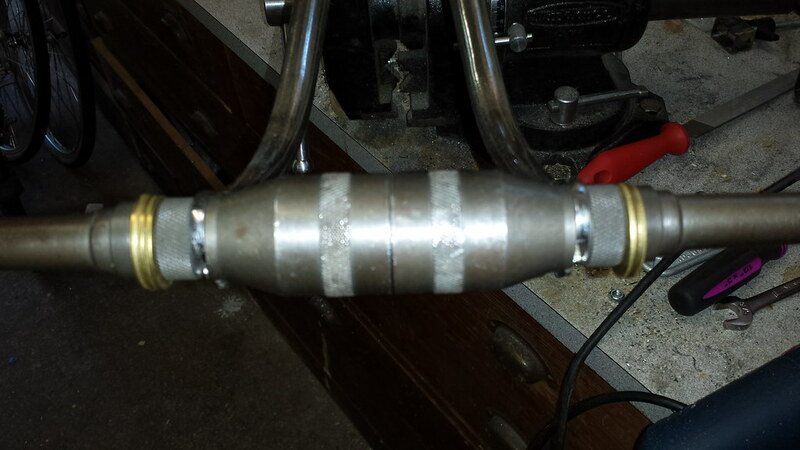 Likewise at the hanger, the entire bore of the threaded hole should be clamped by the wrench to avoid distorting it. These methods allow me to get a bike's visible centering, chainline and steering within detectable limits of accuracy, but might or might not be a bad idea on a really fine bike (or a carbon bike, lol). Again, experience with bending of metal tubing is pretty much a prerequisite to avoid any unfortunate outcome, as is an understanding of how a bike's steering responds to having it's front contact patch off center with the rear portion of the frame. Yes, but that's the way to do it. 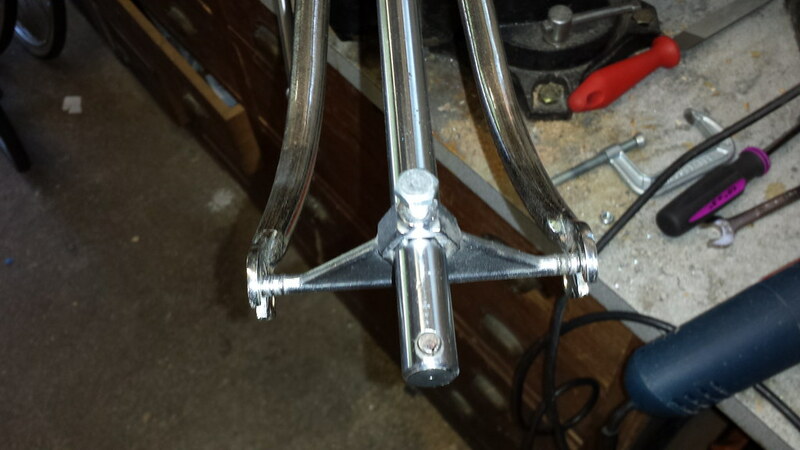 The fork alignment checker you showed will allow comparison of the legs from the crown to the dropouts. Chances are one leg has more curve than the other. If not, then you can either add curve to the longer leg or take it off the shorter. It's easier to take it off the shorter, to be honest. No fancy jig required, just a big rubber mallet and a hard wooden block. But it depends on the rake and the leg angle. Most curved forks' upper legs' centerlines are in line with the steerer tube, all the offset coming from the curve. If you sight down the fork from the top you'll be able to tell whether the upper legs line up with the steerer and each other. I straighten the upper legs out first, then work the rake to correct the length discrepancy. I agree with Bandera. My only local LBS knows steel, and straightened two forks for me using a Park jig. It took them about 10 or 15 minutes to do it and cost all of $20. One of the forks was a bit off, and they adjusted that for free. Luckily I have some jigs that help me visualize what's going on. If the wheel is just a bit off center, I can usually get the wheel centered fairly quickly if it's not out too much. @Mr. 66 was at the Atelier recently with a few frames that needed some fork TLC. There was a particular Peugeot that took several iterations to get the wheel centered. Thank you for all the information and suggestions. I spent some time looking over the fork more. I can see a slight S bend in it. It appears to go in one direction at the top and slightly the other towards the bottom. This doesn't appear to be something that I can repair by eyeballing it in my garage. I needed to get a rear triangle repaired last summer and I wasn't able to find anyone local that could do that so I am confident that a fork is going to be a problem with no local solution. I think I might look for something to replace this one. I wasn't able to find anyone local that could do that so I am confident that a fork is going to be a problem with no local solution. I think I might look for something to replace this one. If you put your general "location" in the provided field in your profile you might find local knowledge from BF members to assist, or not. If keeping the OEM fork in service is important, and there is no guarantee that a "replacement" will not have it's own alignment and "other" problems, sending it off to a qualified shop/frame maker might make aesthetic/financial sense. The dead of winter is the best time for that sort of work but a good shop will give a good turnaround estimate as well as a proper alignment. As Old School shops with the tools and experience to perform what were once basic services on steel framesets close/retire shipping services to the remaining qualified specialists will be the norm to keep our obsolescent/obsolete machines operating properly. Last edited by Bandera; 03-19-18 at 07:33 AM. Thank you for the heads up. I added my location. The dropouts on my old RB-2 were misaligned when I first got it, apparently due to a minor front-ender by the previous owner. I took it into an LBS (in PDX we have several excellent shops), and they straightened it out while I waited, also charging me all of $20-- and they fixed a ding on lip of the steerer tube for free. I sent my badly off-center fork to Dave at Southwest Frameworks in Dallas. Very fair price and quick service. Fork ends. Dropouts are in the back. Kickstands... have any of you ever?? ?